Martha Washington, Original First Lady of the United States. First Lady of the United States is the unofficial title of the hostess of the White House. Because this position is traditionally filled by the wife of the president of the United States, the title is sometimes taken to apply only to the wife of a sitting president, however several women other than wives of presidents, have served as first lady. This situation has arisen due to the president being a bachelor or widower, or when the wife of the president is unable or unwilling to fulfill the duties of the first lady herself. In these cases, the position has been filled by a female relative or friend of the president. To date, no women have served as president of the United States. Presumably, a female president would serve as her own official hostess, and it is not known what title would be applied to a president's husband, who would presumably serve as the host of the White House. There have been many female state governors over the years: their spouses are typically referred to as "the first man" or "first gentleman." Some famous former first ladies include Martha Washington, Abigail Adams, Dolley Madison, Jacqueline Kennedy, Eleanor Roosevelt, Betty Ford, Nancy Reagan, Barbara Bush, and Hillary Rodham Clinton. 3.1 Non-spouse "First Lady" or "White House hostess"
The wife of the vice president of the United States is sometimes referred to as the Second Lady of the United States; however this title is much less common. The term "first lady" is also used to describe the wife of other government chief executives or a woman who has acted as a leading symbol for some activity; for example, referring to Maria Shriver as the "First Lady of California." Although the words first lady had previously been used in combination before, their use as a title to describe the spouse or hostess of an executive was initially an American invention. 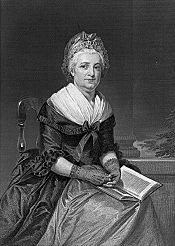 The original First Lady of the United States, Martha Washington, was often referred to as "Lady Washington"
In the early days of the republic, there was no generally agreed upon title for the wife of the president. 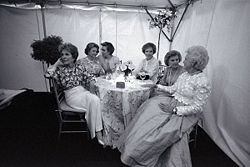 Many early first ladies expressed their own preference for how they were addressed, including the use of such titles as "Lady," "Queen," "Mrs. President," and "Mrs. Presidentress." Martha Washington was often referred to as "Lady Washington." According to legend, Dolley Madison was referred to as "first lady" in 1849 at her funeral in a eulogy delivered by President Zachary Taylor. However, no written record of this eulogy exists today. The title first gained nationwide recognition in 1877, when newspaper journalist Mary Clemmer Ames referred to Lucy Webb Hayes as "the first lady of the land" while reporting on the inauguration of Rutherford B. Hayes. Mrs. Hayes was a tremendously popular first lady, and the frequent reporting on her activities helped spread use of the title outside Washington. 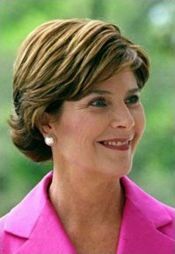 Laura Bush, First Lady of the United States (2001–2009). A popular 1911 comedic play by playwright Charles Nirdlinger titled, The First Lady in the Land, cemented use of the title by the general public, and it first entered the dictionary in 1934. Use of the title to refer to the wife or hostess of a chief executive later spread from the United States to other nations, often without translation of "first lady" into the native language of those nations. In government jargon, "First Lady of the United States" is sometimes acronymized as "FLOTUS," similar to the President of the United States being referred to as "POTUS." The first lady is not an elected position, carries no official duties, and brings no salary. Nonetheless, she attends many official ceremonies and functions of state either along with or in place of the president. The first lady also frequently participates in humanitarian and charitable work. Furthermore, many have taken an active role in campaigning for the president with whom they are associated. Hillary Rodham Clinton took the role one step further when she was, for a time, given a formal job in the Clinton administration to develop reforms to the health care system. Two first ladies have held office in their own right. Hillary Rodham Clinton has been a United States Senator since 2001: her service actually began a few days before her husband's second term as president ended. Eleanor Roosevelt was a member of the American delegation to the United Nations during the Truman administration. She was also briefly a deputy director of the Office of Civil Defense while her husband was president. Non-spouse "First Lady" or "White House hostess"
History of "First Lady of the United States"
This page was last modified on 24 April 2018, at 20:47.